Students will guess when The Living Desert tortoise will emerge from her burrow. When will Mojave Maxine leave her burrow at The Living Desert in 2017? The student-sweet contest is nearly here. A NICE, SNUG BURROW: Much of California has experienced a host of chilly temperatures and damp days at the beginning of 2017, which tells us that wintertime is well and truly here. But when winter will actually end, beyond the easy-to-note arrival of the spring equinox in March, can be a bit of a head-scratcher. Does spring make a true showing when the jasmine blooms near the coast or when the desert ocotillos sprout little red flowers from their spiny limbs? Is spring a thing when the ski resorts move to shorter schedules or when the first pair of flip-flops are donned? Or is the warmer season semi-officially here when Mojave Maxine emerges from her subterranean burrow at The Living Desert? Let's just say that the famous desert tortoise, a beastie known well beyond her Palm Desert-based home, is highly regarded for her talents in the prognostication field. And when she finally does leave her burrow after her brumation ("reptilian hibernation," per The Living Desert), fans'll know that spring has sprung, at least in her more arid clime. THE LIVING DESERT... holds a contest each year for Southern California students hailing from nine counties. The K-12 students submit a guess pinpointing the date and time Mojave Maxine will emerge, with the winner netting a bundle of cool things, including "gift certificates for themselves and their teachers, t-shirts for their class, and a visit from a live desert tortoise!" Nifty stuff, all around. SO WHEN WILL MAXINE... make her 2017 hello? She appeared on Feb. 8 in 2016, but whether the year-starting cold snap will keep her brumating a bit longer will be up to the guessers to predict. As for when desert tortoises seek out their burrows for the winter? The Living Desert reports that this annual event happens "around Thanksgiving." 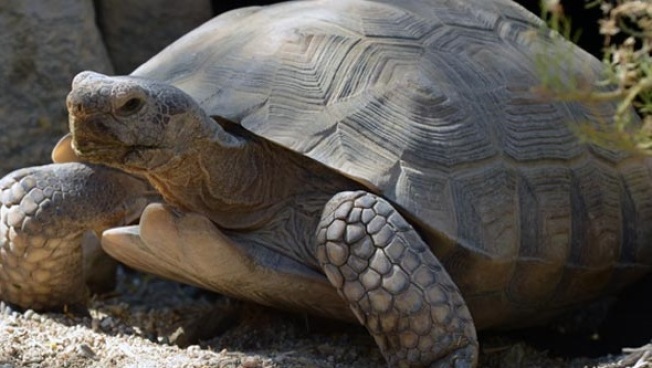 Do note that you can visit the animal park, which spotlights fascinating desert critters like the tortoise, any time of the year, whether Maxine has bid her burrow goodbye yet or not.